I'm currently converting a bunch of 8mm film from the early daze (starting 1974) of hang gliding up around Northern California. I'm posting them on YouTube as they are converted. It's amazing (to me) how durable and well preserved 40+ year old film is. I'm converting them with the Wolverine Data Film2Digital MovieMaker-PRO Converter. It is a blast to relive some of these wild adventure from so long ago . Now every time I drive past Black Butte, on I-5, I'll think of your flights from there so many years ago. Amazing that you guys hiked up that mountain with hang gliders! One thing that can be said for the old standards is that they were definitely lighter than today's gliders. You're fortunate that your 8mm film has stayed so good. My old 8mm stuff is in bad shape. Check out this short clip from a 1978 competition up near Medford OR. This is the first clip I've found so far that shows me flying with YOUR vario!! BTW, regarding Black Butte, rumor has it that Bob Wills flew Black Butte before we did. I was told his grandmother lived in Mount Shasta City so he took his glider up for a flight. I'd sure like to find out if that rumor is true . Sorry to hear about your films, that's a great loss to our history ;(. I was surprised that my old films were still in good shape when I opened the box. I mean, these things were in my garage for 2 decades before I moved from Redding, a place that is as HOT as Hell in the summer! Frank Colver wrote: Now every time I drive past Black Butte, on I-5, I'll think of your flights from there so many years ago. Amazing that you guys hiked up that mountain with hang gliders! One thing that can be said for the old standards is that they were definitely lighter than today's gliders. Very good, Phil! I hope the vario helped you get some extra airtime on the flight. However, I can't take any credit for that fantastic almost no step stand up landing. I have a tendency to believe the rumor about Bob W flying Black Butte, if he had that reason to be in the area anyway. He and some of the others in the "Wills Gang" were always finding places to fly where they hadn't flown before. You guys fly Hat Creek and I've read about the "glass off" there in the evening. I used to love that kind of flying, if I got the chance, just floating around the sky with little or no descent. Sometimes Edwards Canyon, at Elsinore, would do that if a warm "Santa Ana" wind condition was dying in the very late afternoon. If I thought it was going to do that, on a day that I was flying Edwards, I would get my truck shuttled to the LZ late in the day and I would stick around launch to fly just before sunset, looking for the "glass off". Sometimes I would be the only hang glider left at the launch and no one around the LZ when I would land. It sort of transforms one into another world after a busy day flying with the crowd. BTW - I was teasing Bill Liscome when he told me that Big Blue Sky had concentrated on including HG firsts and I pointed out the my vario was not presented in the video even thought it was the first aircraft instrument made expressly for hang gliders. I also pointed out that it could be seen on various control bars throughout the movie. The jerkiness and double image is caused by sprocket registration drift. Try these guys. They don't use sprockets. They use rollers and pin registration. You'll see a big difference. They also fix the color, remove grain and scratches digitally. Go 1080 res. Some labs use a "wet gate" that puts a thin layer of water on the film during the scan. This fills in the scratches. I did not know that you were the first to design specifically for hang gliding - thank you! I only enjoy glass air now. Done are my days of promising God I'd change my ways if he'd just get me off this wild ride . BTW, I just posted a Point Fermin video here: https://youtu.be/lZXW-B9Rlfk. It was taken in 1976, while we attended the World Open. Frank Colver wrote: Very good, Phil! I hope the vario helped you get some extra airtime on the flight. However, I can't take any credit for that fantastic almost no step stand up landing. Thanks for the tip, Rick. Right now I'm just trying to get ~4,000' of footage converted to digital for the lowest cost possible. After I'm done, I may take a selected few and spend the money to have it done professionally. I did check out the link you provided and saved it as a bookmark. Rick Masters wrote: The jerkiness and double image is caused by sprocket registration drift. BigBird wrote: That vario of yours blew my mind at first. . . . I flew the Owens Valley with it in '79 and thought it was broken because it seemed to always be pegged (in both directions)!! Great memories for sure... . The strongest thermal I ever encountered was right in front of White Mountain Peak with my Colver strapped to the down tube. I was about ridge level when the needle pegged up. The glider rolled into the core. The core got even stronger where the audio screamed passed my hearing range. Steeping my bank to stay in the core, I pointed the lower wing tip to the ground and pushed out. I could visually see the ground getting more distant. The pressure was building in my ear and I had to clear my ears going up. That Colver name is etched in my memory. Of course I love hearing Colver vario stories. Thanks to those of you who flew with my varios, I've heard some good ones over the years, like a Texas flight over 100 miles from a 200 foot hill when nobody else could get away because they didn't have the vario, and David Rayborn told me some Oregon Colver vario stories, etc. But here is the winner in my book. A guy flying Edwards Cyn at Elsinore, at1500' AGL, suddenly heard the vario go to full "growl" and he looked to see it falling away from his glider. He watched to see it go into a small canyon above the LZ. After he landed he started bush whacking his way up the canyon through deep chaparral when he began hearing the cheerful note of the vario singing away below the brush. It led him directly to the device lying on the ground. Apparently, crashing through the thick brush had slowed its fall enough to prevent damage. He finished his story by saying that if I ever wanted an endorsement for the vario, I could count on him. I did not know the person very well, so I can't give his name here. If any SoCal pilots know who this was please post it. 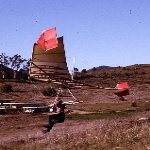 1978 January started my early days in Hang Gliding. All of the 8mm films were lost in my friends house fire August 2, 2017.
sitting too long, and not breaking the tab out so that they couldn’t be recorded over. back up YOUR flight history.